"I want my mom. I want my dad. and hide somewhere safe, and never come out." Prior to getting this book, I wasn't completely sure I would like it. I requested an ARC of this on a whim because as shallow as this might sound, I loved the sight of the cover (Charlie Bowater art is always an immediate yes from me!). I keep stubbornly persisting I dislike the Sci-Fi genre, but then I read books like this which make me highly doubt my point. This book is a little character-driven treat wrapped up in a thrilling space adventure! Set in the distant future, Aurora Rising follows the adventures of a group of misfits at Aurora Academy. Their commander, Tyler Jones is ready to recruit his dream squad, but due to a rescue-mission, he arrives at the draft too late, and in turn ends up with the worst recruits: An arrogant tech-wiz named Finian, his sarcastic older sister Scarlett, Zila the scientist who has no problem shooting her bunkmates, an angry alien and hot space elf called Kal, and Ty's childhood tomboy friend Cat (who has a wee crush on him). But his biggest problem might be Aurora Jie-Lin O'Malley, the girl he missed the draft for. Aurora wakes up two centuries after she left on her mission in a new time and away from her family. But that isn't the only thing her two-hundred years nap has done to her. Aurora now possesses unexplainable abilities, and is part of something way bigger than Ty could have ever imagined. but instead I find myself looking at the squad around me. At these six young soldiers I've suddenly found myself thrown together with. The strangers my life seems to depend on now. What did I think of Aurora Rising? I'd never read a Jay Kristoff or an Amie Kaufman book before this one. In fact, it never even crossed my mind to read The Illuminae Files because, as I said, I thought the genre wouldn't mesh with my interests. I'm very much NOT a big fan of Sci-fi books (or so I keep saying). Anyway, I guess I was WRONG, because I really really liked this! Plot-wise, this book has... I'm gonna say it... a little bit of a Six Of Crows vibe. I don't want to compare it to the Bardugo books because I find that nowadays a lot of heist stories are compared to Six Of Crows, which sells them short in a lot of ways. Aurora rising is very much its own story with its own unique characters, it just also happens to be a heist story of some sort. I won't lie, the first 100 pages had me a little confused. I really had to get into the space-lingo and I found I had trouble keeping up with the rapid introduction of characters. However, as I got past the hundred page mark, I really started to care about this rag-tag team of misfits. Aurora, in particular, reminded me so much of bits and pieces of my favorite female characters, I couldn't not love her. I think for someone who wakes up from a 200-year nap, she did reasonably well. She's reasonably soft and understandibly scared at first, but she really grows as a character as the book goes on. I think, so far, my favorite characters might be Aurora and Scarlett and Ty, but the rest sure isn't far behind! Pacing-wise, I thought this book was pretty well-done. Despite my initial fears, and aside from the first 100 pages, I didn't have trouble getting through this at all! I don't know why I'd been so afraid of the sci-fi genre when this book was a literal gem! The only thing I wasn't as keen on were the relationships in the book. The main ship (no spoilers) didn't really feel like it was well-developed. Considering this is the first book in a series, I won't judge too harshly, but so far I'm not one hundred percent feeling the chemistry between them. There was a different couple I did enjoy, though, but they have more of a slowburn/banter vibe going on, which is why I really liked them. I hope to see all of the relationships improve in future books, especially because I think the authors promised LGBT ships! It's ironic I didn't love the romantic relationship because I usually read YA for at least some romantic storyline. I don't want the ships to influence my opinion too much, because the plot and characters are top-notch and what kept me eagerly turning pages! 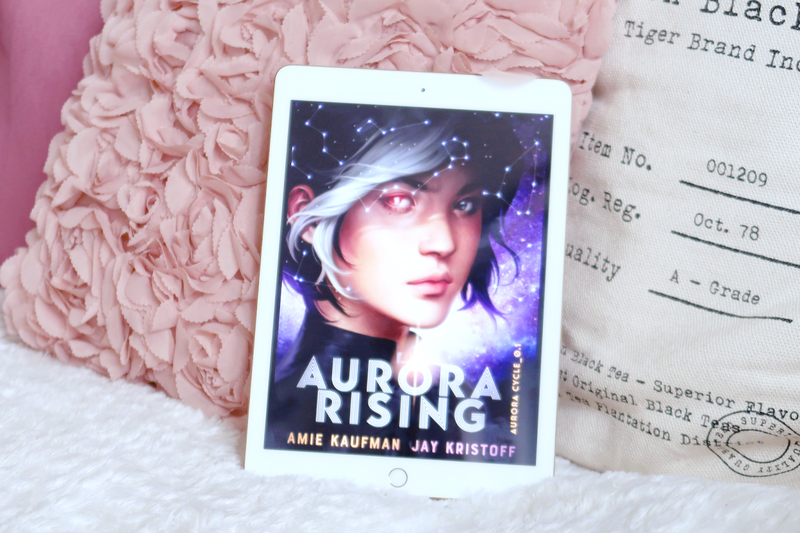 Reading Aurora Rising made me want to pick up every Jay Kristoff and Amie Kaufman book written, so you might catch me reading Nevernight or Illuminae in the future! All in all, I'm rounding this off to a 5-star read because of the characters and plot. I didn't have particular high expectations for this but it was such a sweet surprise and helped me get over my fear of sci-fi! I'm looking forward to reading the second instalment, even though it's over a year away!